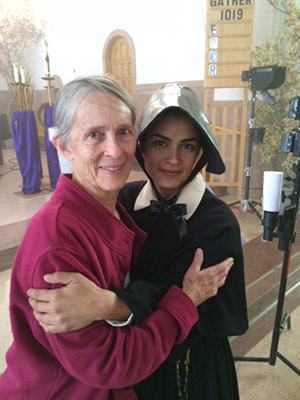 S. Carol Marie Power met Alma Sisneros, the actress portraying Sister Blandina Segale, on the set of the pilot of “At the End of the Santa Fe Trail”. Production recently concluded on the pilot of the television series “At the End of the Santa Fe Trail,” based on the life of Servant of God and Sister of Charity of Cincinnati, Sister Blandina Segale. Sister Blandina is currently under consideration for beatification and canonization in the Catholic Church. Plans for the television series were announced in July 2016; since, production and crew members have visited and consulted with the Sisters of Charity in order to ensure the series will remain true to the story of Sister Blandina, who entered the Sisters of Charity of Cincinnati in September 1866 and eventually found herself ministering in New Mexico. She is widely known for her compassion for outlaws, championing for justice, and building schools and hospitals in the rugged Southwest. In February 2017, Tomas Sanchez, director and producer of the project, and Alma Sisneros, the actress playing Sister Blandina, visited the Sisters of Charity Motherhouse in Mount St. Joseph, Ohio. Ms. Sisneros had the opportunity to visit with Sisters Annina Morgan and Loretto Burke to research her character; both Sisters had the privilege of meeting Sister Blandina in her later years. Mr. Sanchez and Mark Steinig, executive producer, spent time in the Sisters of Charity Archives learning more about Sister Blandina’s life and legacy. The pilot is currently in postproduction and producers were working this week in Los Angeles, California, to secure a full order for the series with a distributor. Producers and those working closely on the canonization process are hoping the series will spread Sister Blandina’s message of nonviolence, her love for the poor, and her advocacy for health care and public schools. Photograph of Sister Blandina Segale courtesy of Palace of the Governors Photo Archives (NMHM/DCA) Negative #67735. The Sisters of Charity of Cincinnati are pleased to announce that the cause for the canonization of Sister Blandina (Maria Rosa) Segale, SC (1850-1941) has been approved. Sister Blandina was born in Cicagna, Italy, and accompanied her family to the United States when she was 4 years old. 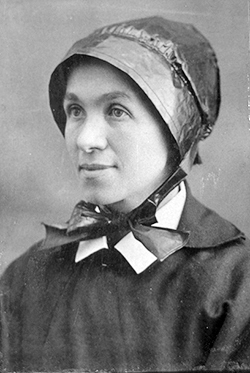 Educated by the Sisters of Charity in Cincinnati, she entered the Congregation in 1866 and began her ministry by teaching in several schools in Ohio. In 1872 the young Sister was sent to Trinidad, Colorado, and for the next 21 years served on various missions in the Southwest, including Santa Fe and Albuquerque, New Mexico, and Pueblo, Colorado. Her colorful memoir of her years in Colorado and New Mexico has been published as At the End of the Santa Fe Trail. Her adventures have been featured in novels, television programs, histories, and even a comic book. These often focus on her fearless befriending of Billy the Kid and his gang and also Native Americans in that hostile era. Returning to Ohio in the early 1890s, Sister Blandina and her sister, Sister Justina Segale, were sent “to see if they could do anything for the poor Italian [immigrants]” in the inner city of Cincinnati. The story of their founding and managing the Santa Maria Institute (1897), the first Catholic settlement house in the United States, is awe-inspiring. The Sisters along with their co-workers and collaborators assisted many needy groups in the city and became involved in issues such as human trafficking and juvenile delinquency. An account of this work is told in a series of journals kept by Sister Justina, and in The Story of the Santa Maria Institute by Anna Minogue. The cause of Sister’s canonization is being led by the board of St. Joseph’s Children, Albuquerque, New Mexico, a member of Catholic Health Initiatives. Based on documents already submitted to the Vatican, Sister Blandina can now be called by her new title, Servant of God. This is the first step towards canonization. The Archdiocese of Santa Fe, New Mexico, will celebrate with two events. On Wednesday, June 25 a press conference will be held at 11 a.m. Mountain Time at CHI St. Joseph’s Children (formerly St. Joseph Community Health) in Albuquerque to announce the Vatican’s immediate permission to open the cause. On Sunday, June 29 at 3 p.m. Mountain Time there will be a pontifical ceremony at St. Francis Cathedral in Santa Fe. There Archbishop Michael Sheehan will post the official decree on the Cathedral Basilica of St. Francis of Assisi’s doors, announcing the cause of Servant of God Sister Blandina.